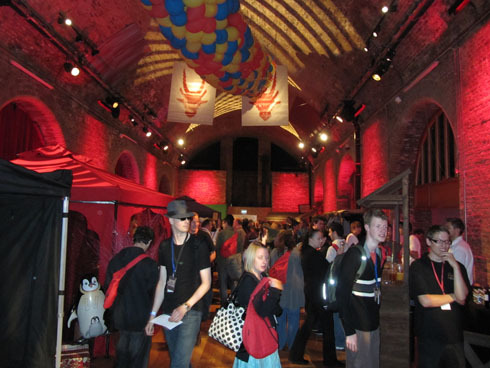 Unless you're new to RuneScape or haven't played in a while, you've probably heard about RuneFest. 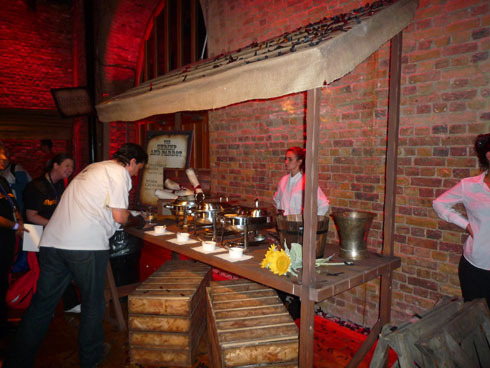 It was a real-life RuneScape event in London organized by Jagex on August 28th, and many of the most dedicated and loyal RuneScape players attended the event. A few months ago, Jagex told me that I was one of two Gold fansite owners that would get a fully paid trip to London to attend RuneFest. Back then, I thought that only a few selected fansite admins were invited. Little did I know that they also invited all 5 gold ticket winners, the winner of the Machinima competition a few months back, and several top players. They didn't even tell me that I was going to visit the Jagex offices in Cambridge until I got the itinerary about two weeks before RuneFest! Living in Norway, Jagex had booked a flight from the capital, Oslo, at noon. Problem is, I live 250 miles (400 km) away, so I had to book another flight to Oslo. Long story short, I had to wake up at 5 am to catch a bus to the airport at 6 am. Not cool! After sleeping all the way to England, I had to wait about two hours for the driver that would take me to the hotel. Luckily, I found other lost-looking RuneScape players that were looking for the same driver. One from the Netherlands, one from Germany and one from Estonia. One of them was under 18 and had his mother with him. She was clueless about the game, so we tried to explain the concept of fansites, how some player could be higher ranked than others and so on. That must've been one of the first time I've tried to explain RuneScape to a non-gamer! It wasn't until I arrived at the hotel that I realized that Jagex had invited more than 20 people. I got to meet all the other VIPs (those who were invited by Jagex), Mod Hohbein and Mod Paul M. We went to a pub for dinner, which was so crowded that we could barely hear each other talking. I still got to speak with some of the VIPs about fansites, RuneScape, life, the universe and everything. We were going to visit Jagex! On the trip from London to Cambridge I chatted with some of the other fansite people and Mod Hohbein (who is responsible for fansite communication at Jagex) about fansites (surprise!). 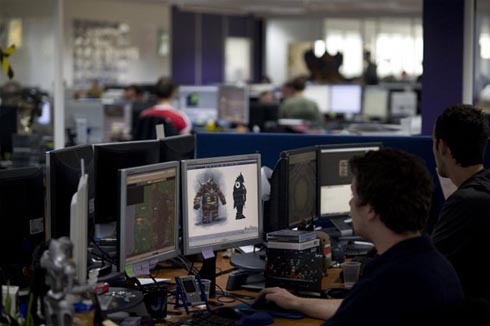 We discussed ideas that we had about how Jagex could provide us with more useful material, and we've actually received some really good material following the conversation! 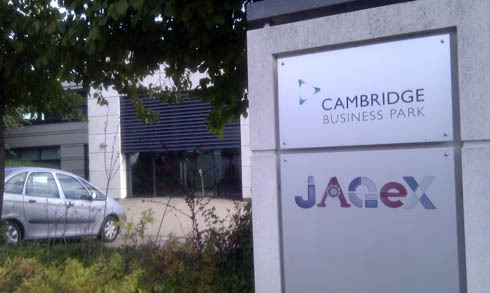 When we arrived, we finally spotted the Jagex logo outside one of the buildings. Cool! There were only a few people present when we visited, because most of them were in London making final preparations for RuneFest. After lunch we visited the development offices in a separate building. 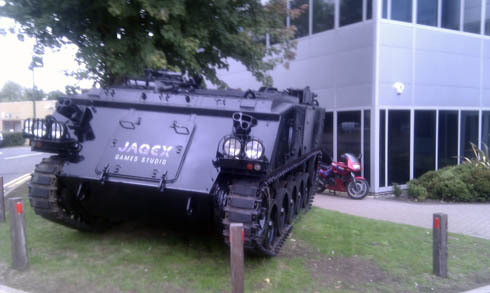 Outside the development office they had a tank with the Jagex logo on it. Why, you might ask? Well, why not? It was a long day and after dinner some people fell asleep at the table (probably due to jet lag), and on the way back to London nearly everyone fell asleep. We arrived at the venue around 2 hours before RuneFest opened, and had a breakfast with Andrew, Paul and a few other jmods, and also had a brief Q&A session with them. 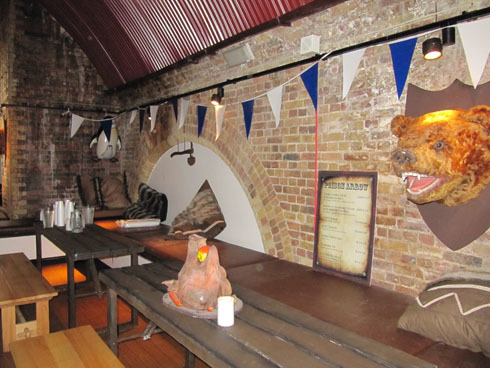 We then got a private tour of the venue before it opened. We were given a goody bag which contained a RuneFest pen, some concept art, the first chapter of Betrayal of Falador (the first RuneScape book, for those of you who haven't heard about it) and a few other things. 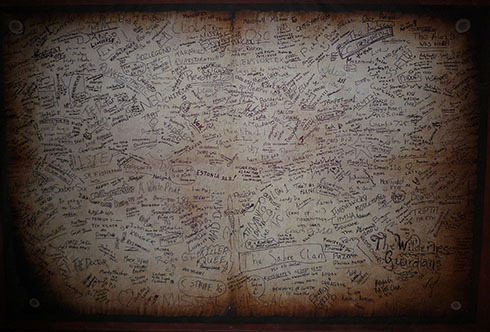 There was a "clue scroll" which led to a real-life treasure trail similar to the one in RuneScape. There were also penguins scattered around the venue, with one letter each, resulting in an anagram. 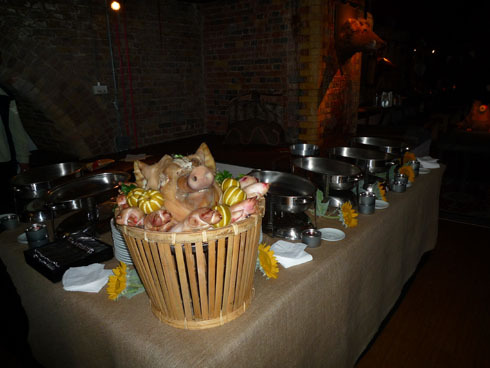 If you solved the penguin hunt anagram or clue scrolls, you got a small reward. 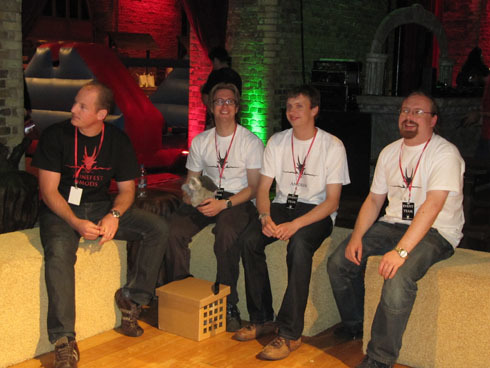 The "top" people at Jagex (from left to right): Mark Gerhard (MMG), Ian Gower, Andrew Gower and Paul Gower. They were always looking elsewhere during the photo session, so this was the best I got. 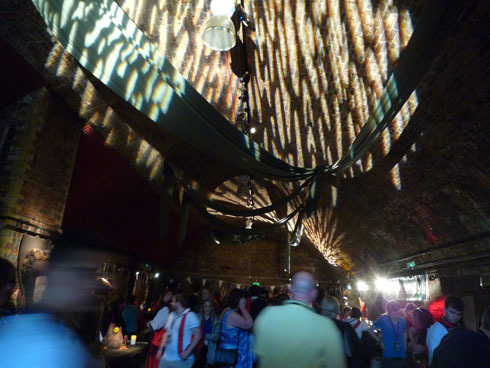 The venue was separated into different areas with names from places in RuneScape. If you were hungry or wanted something to drink, this was probably the right spot. I spent a good time here speaking with various jmods about pretty much anything. Nobody here before RuneFest opens. This was a good place to meet and talk to people! 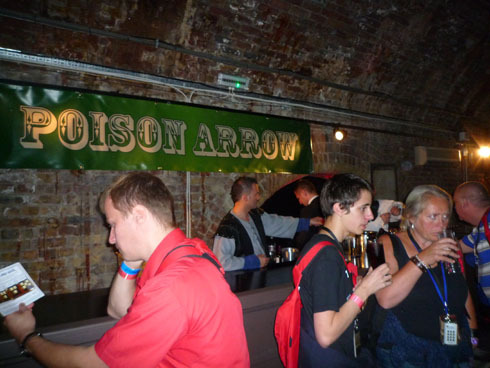 The poison arrow pub is now crowded. I liked how the roof was lit, so I had to take a picture of it. The guy in the left corner was looking at a Penguin Hide & Seek paper. He has probably found all the letters, but is trying to figure out the anagram. 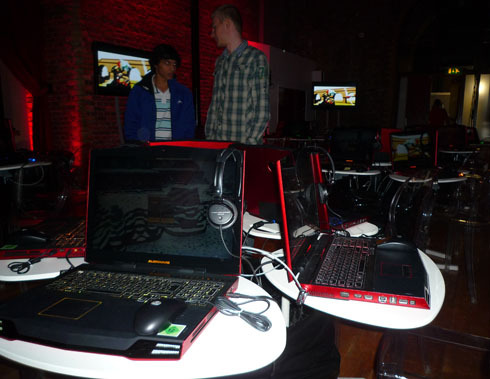 The gaming zone had dozens of computers with RuneScape running, and throughout the day there were dungeoneering events, clan wars against J-mods and the possibility to just play with people you met at RuneFest if you wanted. 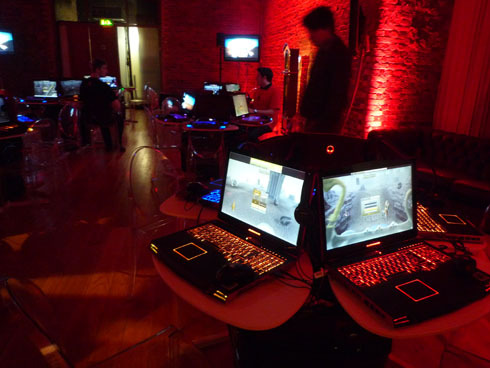 Some of the computers at the Draynor Manor Gaming Zone. The Gaming Zone. 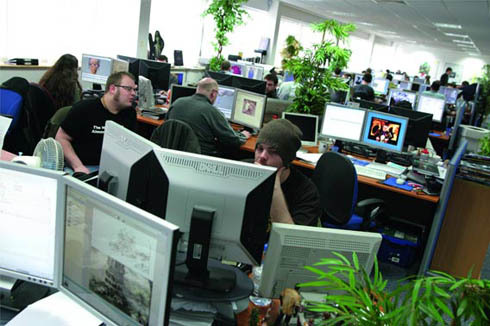 The two people in the background are two of the very top RuneScape players. Clan wars against J-Mods. 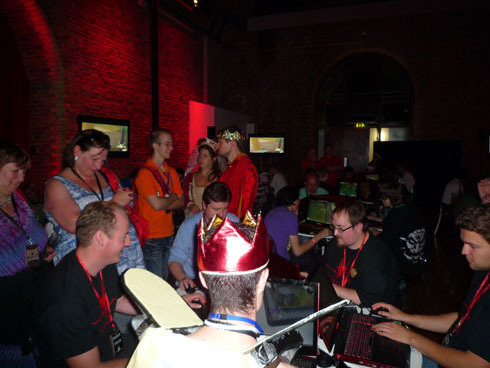 On the left, Mod MMG (Mark Gerhard) is doing his best to avoid getting killed by all the good RuneScapers. As far as I know, the Jmods lost. The Draynor market contained market stalls, video games, sword fights and was generally a good place to hang out. A crowded real-life Draynor Market. Balloons were hanging above the market, and this was the place where there would be a balloon drop like the balloon drops in the Falador Party Room! 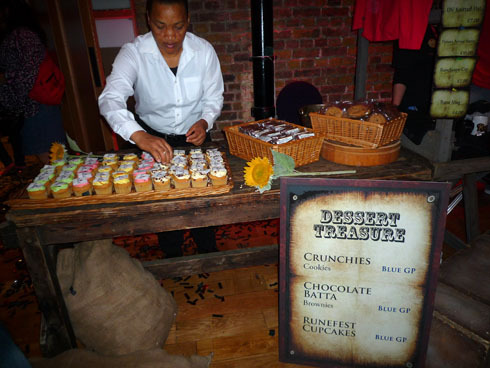 We could buy crunchies, chocolate batta and RuneFest cupcakes using "blue gp". We could buy differently coloured "gps", which we could then use to buy food and drinks at the market stalls. This is where we could get our GPs. But wait! He's selling them for real money. Uh-oh. 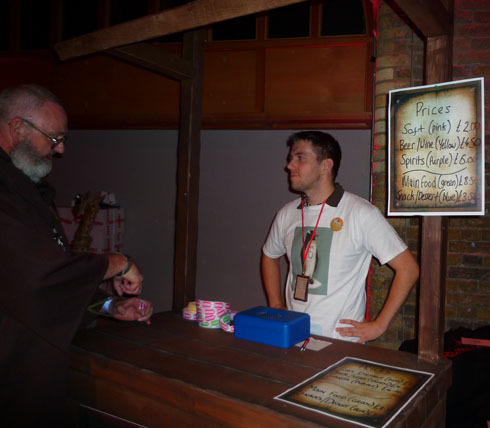 I think we have a real-world trader at RuneFest! And - oh! We spotted one of the penguins for the Penguin Hide & Seek, with the letter S.
A market stall in the Draynor Market. A sword fight in Draynor Market. The rules are very simple: The first one that falls off, loses. 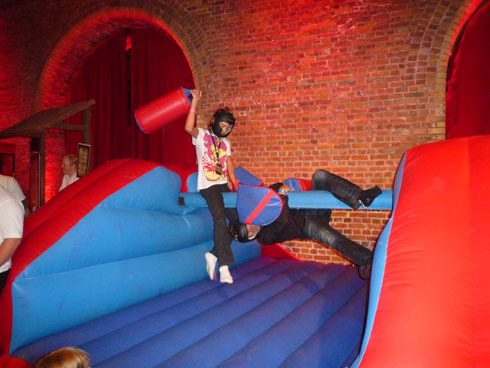 Jagex called this jousting. I guess it kinda fits. Varrock Museum had dozens of images that were submitted by players before the event. More notably, this was where you could find the RuneFest wall of fame that anyone could sign! 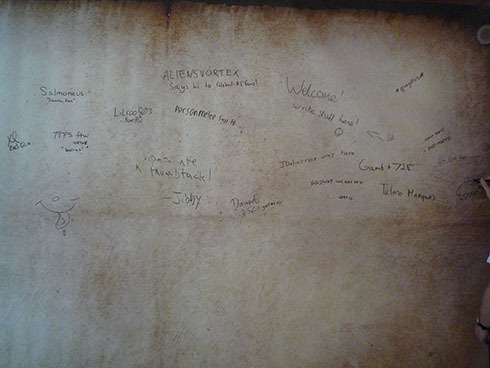 The wall of fame when only the VIPs (those who were invited by Jagex) had signed: Excl, Salmoneus, Syzygy, Lilroo503, Aliensvortex (that's me! 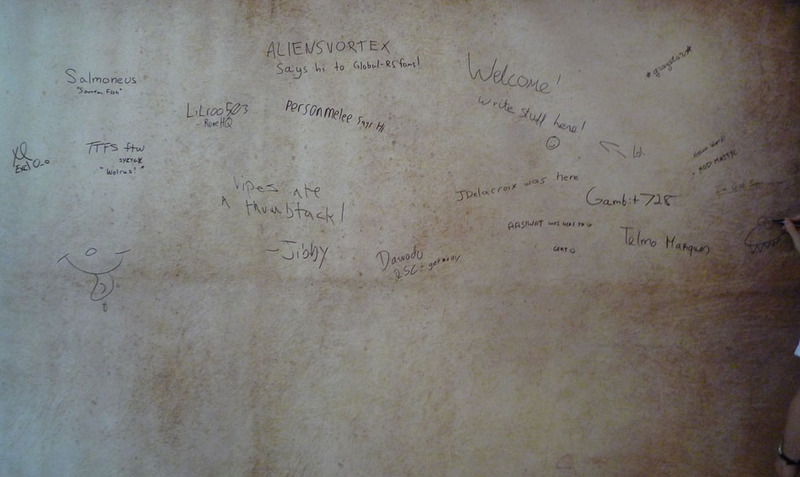 ), Personmelee, Jibby, Dawodo, Jdelacroix, Aasiwat, Gertjaars (he only wrote Gert), Graystar, Gambit728, Telmomarques, Mod MattyC and Im God Sepp (just above the dinosaur). Click the image to view a larger version. 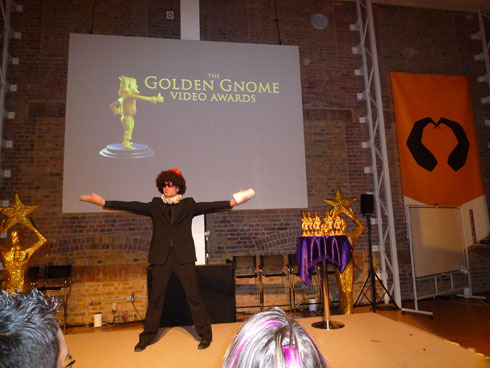 The Varrock square had the largest stage at the venue and was used for the insider sessions and the Golden Gnomes. 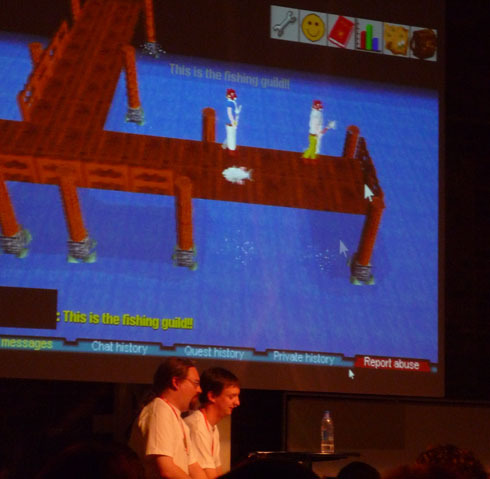 Paul and Andrew Gower at the RuneScape Genesis insider session, talking about the early years of RuneScape and how he made the game and what Jagex is today. Lots of people were present at all the insider sessions. Party Pete announcing the Golden Gnomes. 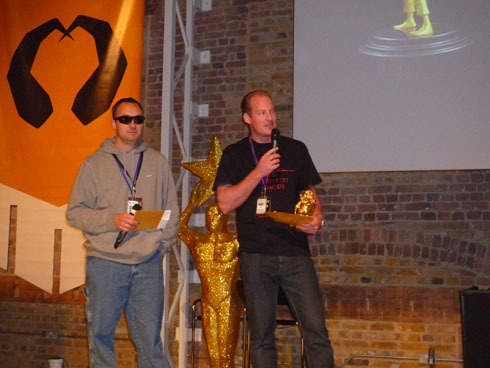 Excl (winner of the 2009 RuneScape Machinima Contest and one of the best known RuneScape video makers) and Mark Gerhard (Jagex CEO) announcing some of the Golden Gnomes winners. So what was so great about it? 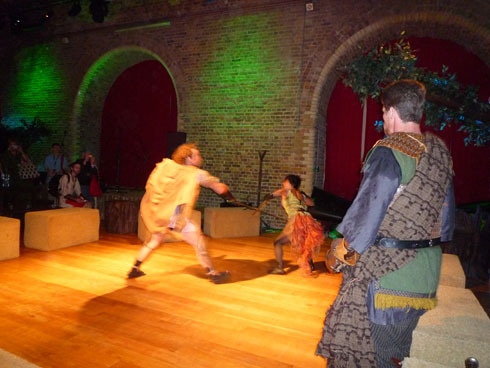 Before attending RuneFest, I had absolutely no idea what it would be like. I looked forward to meeting people from other fansites and the developers from Jagex, but didn't know more about the event than anyone else did. I also wondered how I could spend 9 hours (actually closer to 11 since the VIPs were there quite early) at the event. However, looking back at it, I did have an absolutely great time there. 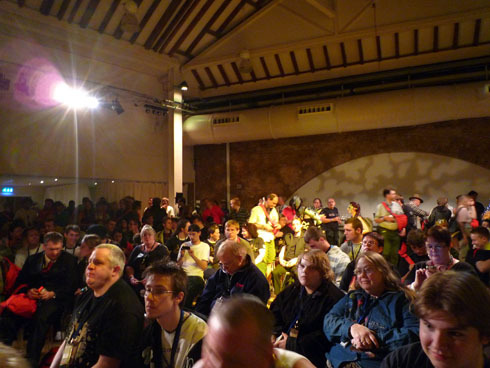 The people at RuneFest were an extremely diverse bunch of people, all of them with a strong interested in RuneScape. Some clans even had several members attending the event. Meeting all these people was fantastic, and after spending a day with lots of fellow RuneScapers and Jagex employees, I no longer view the game as "pixels on a screen". Sure, that's what it might look like, but beyond it is an incredibly rich, diverse and friendly community with people from all over the world, sharing a common interest in a simple computer game. One of the VIPs was accompanied by his mother who was absolutely clueless about the game, and she described it as "entering a completely different world, it was extremely well done and the place had a buzz that was hard to describe". Even she enjoyed the event. So for those of you who rant about it being a stupid NerdFest, get over it. Maybe you will reconsider when (and if) the next RuneFest is announced. 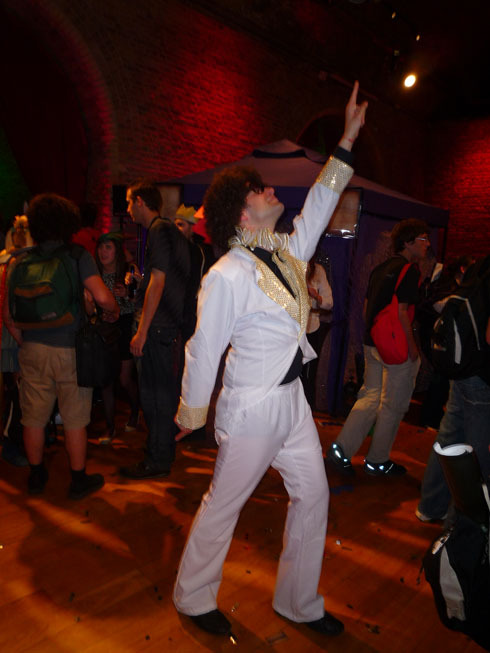 Thanks to Party Pete and everyone at Jagex for a giving me a wonderful time at RuneFest! Thanks to Dawodo from RSCommunity.de for letting me use some of his photos. If you wish to comment on this article or ask any questions about my visit to Jagex or RuneFest, please make a post in this topic.